On Wednesday night, I had the opportunity to watch a pre-screening of Divergent. Before the movie started, I told myself that I did not want to be as critical as I was while watching The Hunger Games — I just wanted to enjoy and appreciate it for what it was. For the most part, the movie generally stayed true to the book. There were a few times when certain things were changed, but it didn't alter the plot or any of the ongoing themes. Most of the things that were added/changed were done to keep the audience entertained and interested. Although Divergent is a great book, it doesn't translate very well into a movie. The book is mostly about Tris' internal thoughts and feelings toward the different obstacles she has to face, which can't be visible or adapted in a movie (unless Tris does a voiceover for the entire movie ... that would be very strange). I also felt that there were a lot of events that happened in the book and, in turn, made the movie feel extremely rushed. I won't get into the specifics of exactly what, but I felt like the important things that happened near the ending were brushed over so the movie could make time for all the action points. However, many of the scenes were similar to what I pictured while reading the book (although the zip lining scene was even BETTER) and well-produced. I really loved watching all the fear landscapes and seeing the Dauntless run around and scale buildings. I also enjoyed the movie soundtrack — Ellie Goulding was an awesome choice and I feel like she embodied the theme of the movie well. I gave this movie 3.5 stars (out of 5) and will probably watch it again when it hits theaters. 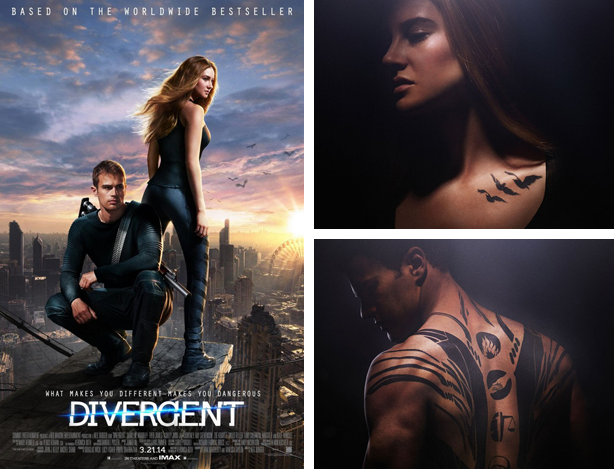 Will you be watching Divergent later this month? Stay tuned for the "thoughts + discussion" post on March 21st! I'm glad you liked the movie! I definitely want to see it once it comes out! I also felt like it wouldn't translate well because it's about her internal dialogue, but I'm glad they partly succeeded!